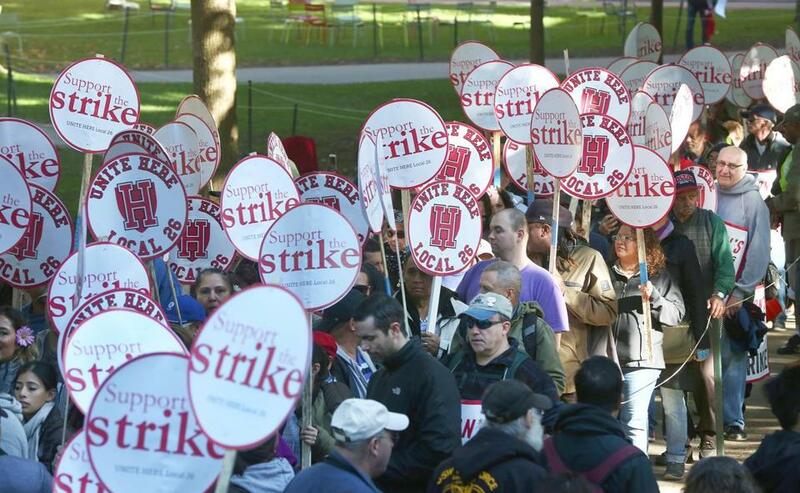 Harvard University dining hall workers rallied Oct. 5 after going on strike. Harvard University reached a tentative contract agreement early Tuesday with about 750 dining hall employees who have been on strike for nearly three weeks — the latest in a series of high-profile labor standoffs that have ended with a union claiming victory. The striking employees could be back in campus dining halls as soon as Thursday if they ratify the agreement in a vote scheduled for Wednesday, ending what was the first work stoppage at the school since 1983. Brian Lang, president of Unite Here Local 26, the union representing the workers, said the university agreed to demands for a minimum full-time salary of $35,000, no increases in health insurance costs, and compensation for employees who are laid off during the summer. “We’ve accomplished all the goals we had set out at the beginning of this bargaining process,” Lang said. The settlement may well resonate beyond the gates of Harvard Yard. It marks the fourth time in recent months that a union has bucked a long and steady decline in the clout of organized labor groups. In May, about 36,000 workers in Verizon’s dwindling landline business — including 5,000 in Massachusetts — won a pay raise of more than 10 percent after a weekslong national work stoppage. Two other groups of union-backed employees went to the brink of walking off the job. Nurses at Boston’s Brigham and Women’s Hospital were prepared to strike in June, as were thousands of janitors in September at Boston-area office buildings. Both the nurses and janitors unions negotiated favorable contracts at the eleventh hour. Even as the Harvard strike winds down, a labor dispute at Tufts University in Medford is coming to a head. About 200 janitors are scheduled to vote Thursday to authorize a strike if their union cannot reach a new contract with the school’s facilities maintenance company by Monday. The workers are represented by the same local of the Service Employees International Union that negotiated for the office-building janitors. The show of strength for organized labor comes at a time when just 11.1 percent of the US workforce is unionized. Some labor specialists say changing economic conditions are giving unions newfound leverage, despite their relatively modest ranks. In Massachusetts, for instance, the 3.6 percent unemployment rate has increased workers’ bargaining power, said Paul Harrington, director of the Center for Labor Market and Policy at Drexel University, especially at lower pay levels. “Organized labor is being a little bit tougher in negotiation, because the alternative supplies of labor are kind of drying up,” he said. Eve Weinbaum, a professor of labor studies at the University of Massachusetts Amherst, said pro-labor positions championed by Democrats Bernie Sanders and Hillary Clinton during the presidential campaign are indicative of increased sympathy for unions. On the Republican side, Donald Trump has made creating well-paid jobs a rallying cry. A recent Gallup poll showed 56 percent of Americans support labor unions, up from a low of 48 percent in 2009. The announcement of the Harvard settlement Tuesday came after a nearly 12-hour marathon bargaining session Monday that was punctuated by a student sit-in at the Mount Auburn Street office building where negotiations were underway. More than 200 student protesters pressed administrators to meet the workers’ demands. They were among the more than 300 students who walked out of classes in support of the striking workers. Tuesday morning, about a dozen workers gathered at the school’s Science Center Plaza as news of the deal spread, greeting one another with hugs and high-fives. Ed Childs, a cook at Harvard for 40 years, said the employees are “a part of history” because issues they fought over — health care and better treatment of part-time employees — are relevant nationwide. The Harvard workers went on strike Oct. 5, after their contract expired on Sept. 17, an end-date that had been extended from June. Negotiations began May 20, but after 19 fruitless sessions, Unite Here Local 26 called for a walkout. The school closed about half of its dining halls and staffed the rest with managers, nonunion workers, and temporary employees. Harvard University Dining Services provides approximately 25,000 meals a day to students, faculty, and staff across campus. Throughout the negotiations, Harvard emphasized that dining hall workers were paid an average hourly wage of nearly $22, well above what their counterparts earn at other area colleges. It also said rising health care costs compelled the school to seek larger contributions from union workers. The union argued the workers weren’t earning a livable wage and that the health insurance increases the university proposed were unreasonable. Also, it said, workers who aren’t given hours during the summer can’t collect unemployment because Harvard’s status as an educational institution makes it exempt from that benefit. Student groups, alumni, elected officials — including US Senator Elizabeth Warren — and the Cambridge and Boston city councils had called on Harvard to meet the workers’ demands, citing its $35.7 billion endowment and the more than $7 billion it raised during an ongoing capital campaign. Katheleen Conti can be reached at kconti@globe.com. Follow her on Twitter @GlobeKConti. Adam Vaccaro can be reached at adam.vaccaro@globe.com. Follow him on Twitter at @adamtvaccaro.